The Bernese Mittelland is divided by an imaginary line that separates German-speaking Switzerland from Suisse Romande, where French is the dominant language. The town of Biel (German) or Bienne (French) is on that linguistic border, and the integration of the two cultures is reflected in the URL of the city's official Web site (www.bielbienne.ch) and the bilingual street signs. Biel/Bienne has long been a center for Swiss watchmaking. Local brands include classic names like Movado, Omega, Rolex, and Tissot, along with the equally famous (if cheaper and trendier) Swatch. Manufacturers of machine tools and electronics are also important, and the town is home to a major architecture and engineering school. But don't get the wrong impression: Biel/Bienne isn't just a modern industrial center with 53,000 residents. It also boasts a picturesque old town and has a lovely lake at its front door. 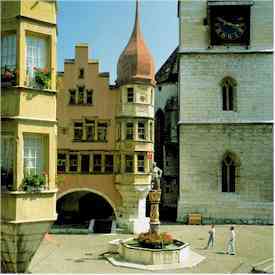 The Ring (see photo) is the historic center of Biel/Bienne, with a fountain dating back to 1546. From here, it's only a few steps to the Burggasse/Ruhe de Bourg, where you'll find the Town Hall (1534), a theatre that once served as an armory (1591), and the Fountain of Justice from 1714. Once you've explored the old town, you might want to visit some of Biel/Bienne's museums, such as the New Museum (art, archaeology, and other topics) and the Omega Museum (clocks and watches). The lake is another attraction, with steamer cruises from late spring through early fall. And if you're partial to views, take the Magglingen and Leubringen Funiculars, which climb the local hills to scenic overlooks and walking trails. ABOVE: Houses on the Bielersee. By train. Biel/Bienne has hourly train service from Bern, Basel, Zürich, and Geneva. By car. From Bern, head north on the N1 motorway and turn left when you reach the E27 road, which will take you the approximately 40 km (25 miles) to Biel/Bienne. 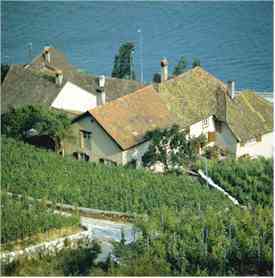 The city is also on the main road between Neuchâtel and Solothurn. By boat. Steamers connect Biel to Neuchâtel and Solothurn from late spring through early fall. The city and regional tourism site is packed with English-language advice. The official Web site of "the biggest bilingual city in Switzerland and the world's capital for watchmaking" has information in German, French, and English. Switzerland's leading discount reservations service is also our booking partner. Download the latest edition as a PDF file in German or French.